Singapore ride-hailing app Ryde announced today (26 April) the launch of RydeX, its private-hire service. The service will be available from 2 May 2018 on iOS and Android mobile devices. According to them, the launch of RydeX is one step to building a "complete mobility experience for drivers and commuters". 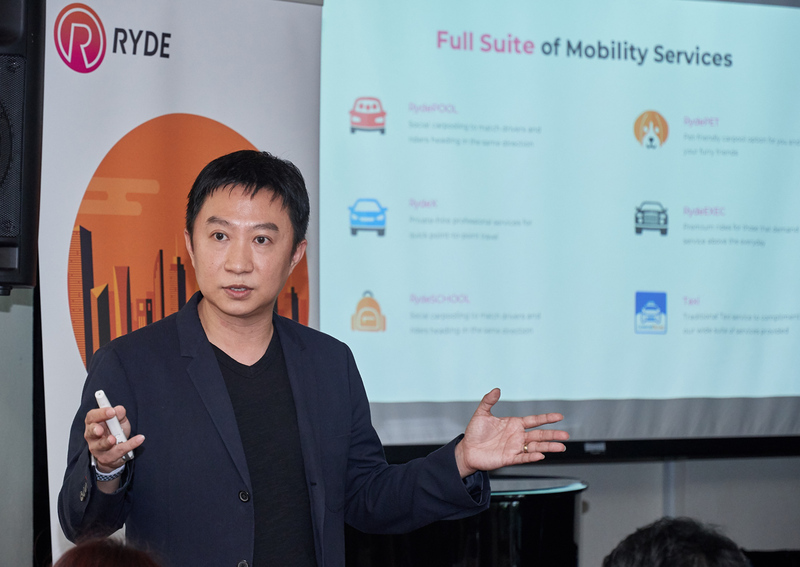 Founder and CEO of Ryde, Terence Zou said, "This is a big milestone for us and we are very excited to be able to offer Singaporeans with another alternative to travel using RydeX." Ryde users (Ryders) can use RydeX in two ways. The first is the RydeX Scheduled service which allows users to book a private-hire car from 10 minutes to 7 days in advance. One might think of it as Ryde's rendition of GrabHitch. RydeEXEC, the second option, is a premium service that connects users to luxurious cars and to "the best drivers available". Ryders may ride on cars like the Toyota Alphard and or luxury cars from BMW, Mercedes, and more. Terence revealed that RydeEXEC drivers will be screened and must meet and maintain service ratings of at least 4.7 to be eligible. Getting a RydeX ride would take an average of 20 minutes from the time of request, shared Terence. With RydeX, he explained that Ryders can also request for a specific driver if they had experienced exceptional service previously. The company will also introduce two-way ratings as they believe this will create a more conducive environment for both drivers and commuters, and encourage good ride-sharing etiquette. Should the driver or Ryder experience an unsatisfactory ride, they may choose to block the passenger or the driver. This implementation seems complementary with the rating and driver-request services. In the case of an MRT breakdown or a torrential downpour on a particular day a Ryder has scheduled in advance her ride to work, Terence said the original fare will be honoured. Drivers and Ryders can also cancel a ride and not need to pay any cancellation fees. However, they are currently reviewing the possibility of that policy. Another innovative feature on the RydeX is the tipping service after a trip. Terence explained that this is an extra incentive for drivers to provide good service as tips go directly to them. Satisfied Ryders can choose to tip the drivers any amount they like once their trips are complete. It will be easy and convenient and there will be no service fee, so Ryders will not be discouraged to tip. The CEO explained that RydeX fares are upfront and fixed. It is calculated based on dynamic pricing on a zonal approach, meaning it will take into account the time of day, traffic conditions, tolls, and surcharges of the route. Ryde implements a cap of $100 on total fare including surge. For RydeX Scheduled, the base fare is $8 regardless of distance and 60c per kilometre. These drivers earn a commission of 10 per cent while Ryders using this service enjoy 10 per cent cashback. On how they determined their base fare, according to Terence, they found that the average carpooling distance is 16km. For RydeEXEC, its base fare is $18, and drivers also earn 10 per cent while Ryders using this service receive 5 per cent cashback. RydePET's fares are 25 per cent higher than RydeX as the company noted that it is a niche service, and there is low demand and supply. Terence explained that if the Ryder's fare meets a minimum of $7, the cashback will automatically be rolled back to the Ryder's digital wallet within its platform, RydePay, and the cashback will be applied instantly on the next trip. Ryde believes that the lowering of the driver's commission rate to 10 per cent passes on savings to commuters in the form of lower fares, and to drivers, higher earnings. This translates to fares that are about 5 per cent cheaper than competitors'. On incentives, Ryde believes in taking the bundle incentive approach where it doesn't matter what job or which service the driver chooses to accept. They also do not impose a minimum pick-up rate as a way to encourage drivers to drive more. The Harvard Business School alumni said the company saw it "opportune" to enter the market with their services following Grab's acquisition of Uber, and will launch an on-demand service when the time is right. He said Ryde's entrance to the market two years ago had been discouraged by people around him as they didn't think it would have a chance to go up against the two giants, but he saw it as a challenge to be better and different. After two years of going up against the two Goliaths, he is "unfazed" by any new competition (read: Go-Jek Singapore) and in fact, relishes it because he thinks the market should be "open and contestable". Terence expressed his wish to work with regulators to move the market forward, and believes that private-hire drivers should not be exclusive to one company or platform. On the company's profitability plans, he shared that the ride-hailing market here sees more than 1 million trips taken daily, with the average fare being $15. So while a 10 per cent commission is not high, the business will still be sustainable. He emphasised the company's focus on growing profits as opposed to gaining large market share in a short amount of time, stating that gaining 20 per cent of the market share would be "ideal" at the moment. When asked about their drivers, Terence said the company managed to recruit 5,000 drivers in about one month, and reckoned that the sudden increase of drivers on Ryde's platform could be due to the Grab-Uber merger that happened last month. Wrapping it up, he shared that his aim for the company is to be "asset-light", and prefers not to "chase (user) acquisition" aggressively by giving out discounts because he thinks "promo codes are passe". He believes Ryde's referral programme and cashback model are better alternatives and promise sustainability.